The Greek car rental companies ranked mid-field in this test. However, some extreme exceptions were found. For instance, the two best candidates and the second last candidate from a total of 58 test candidates were found in Greece. On the whole, only three of the eleven car rental companies failed the test. The Very good result recorded for rental agreement layout and in the "Lighting/electrics" and "Engine compartment" categories made a positive impression. On the other hand, points were deducted considerably for Customer service. Avis in Chersonisos with a Hyundai Atos was both the national winner and also the overall winner, closely followed by Avis in Faliraki with a VW Polo. The poorest result went to Rental-one in Crete with a nine year old Daihatsu Cuore and more than 200,000 kilometres on the clock. 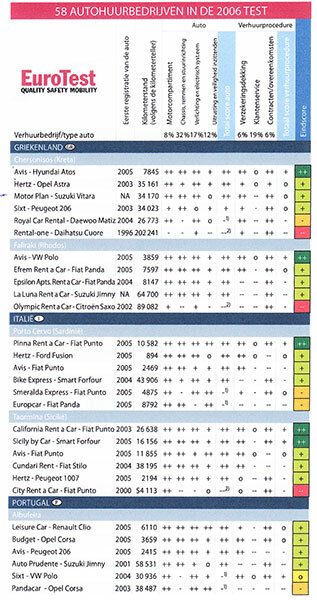 The two off-road vehicles from Motor Plan in Chersonisos and La Luna in Faliraki did well with a “Good” in the overall result. At the same time, Motor Plan with a Suzuki Vitara achieved the best result from all the seven off-road vehicles examined in the test. carmotorplan.ru | Development - Design Melkin Ltd.